We have been given the gift of the Sabbath. Now may we return the Father's gift to us—the gift of a submissive life of Sabbath observance that truly makes it a unique and sanctified day of study, song, worship, fellowship, and good deeds. 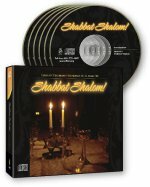 Look at some of the interpretations, deeper meanings, traditional applications, and messianic innovations surrounding Sabbath.